According to Wikipedia, calling "dibs" is an informal convention where one declares a first claim to something to which no individual has any clearly recognized right. 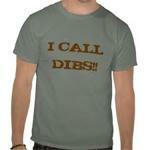 Calling "dibs" is only possible when the caller is fit and able to take care of the claim. Such a declaration is often recognized in certain cultures, or sub-cultures, as a means to avoid arguments over relatively trivial issues. We at the Vintage Athletics Booster Club are using SPORT NGIN's “Dibs” system to schedule and manage our numerous volunteer needs and opportunities throughout the calendar year. So, please, take a look at "Dibs" and raise your hand today!